Click on the "Events" tab located at the upper right hand corner of any library web page. Select the calendar option: "Storytimes", "Programs", "Classes", or "All Events". Or search for an event by keyword. Filter the results on the left side of the screen by location, event type, and age group. 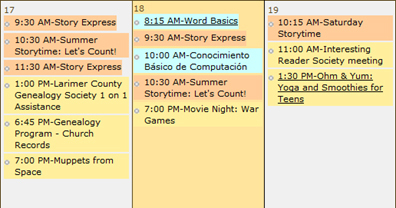 Tip: Storytimes are listed in orange, Classes are listed in light blue, and Programs are listed in yellow! The times and locations of an event or program can be found by hovering a mouse cursor over the event. Clicking on a program will give a more detailed explanation of the event, its location, who the organizer is, and other information. Events that are underlined require registration. Simply click on the title of the event and fill out the registration form.